Gulf Front Seacrest Beach House + Carriage House, sleeps 21, private beach access!New furniture! Seacrest Beach Gulf Front House + Carriage house, sleeps 21, breathtaking views, 8 bikes included, heated private pool and spa! 30A ESCAPES Presents "CYPRESS BEACH"
Experience a vacation like no other as you stay in your private GULF FRONT home! This luxury home is located in Seacrest Beach in the highly sought out area of 30A. Florida just a short 10-minute walk to the famous Alys Beach Shopping Center that offers seaside style clothing to delicious food selections. 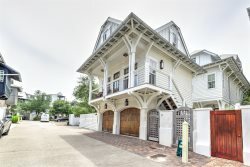 Cypress Beach offers a beautiful gulf front main house and a carriage house behind built like a duplex that sleeps 21 guests and offers a private beach access! There is plenty of parking available, great gulf views, private beach access, and a large private heated swimming pool. There are two separate properties that combine to make up this 8 bedroom, 7.5 bath beach house. The main three-story house overlooks the beautiful emerald waters of the Gulf Coast. As you step through the large stone entryway, you will notice exquisite hand-picked red cedar logs which are a stunning architectural feature throughout the entire home. The first floor includes an entertainment area,a bar that seats 4 with stainless steel appliances, and features a unique custom indoor spa with windows that face the beach, allowing you to enjoy the magnificent gulf views. The first floor also features a steam shower that doubles as a sauna and access to the elevator. As we continue to the second floor, you will be amazed by the open, spacious kitchen, with a granite counter-top island, stainless steel appliances, two dishwashers, and a separate walk-in pantry! The third floor of this gorgeous beach house features three guest rooms, two with king beds and private bathroom. The third guest room has twin bunk beds and a private bathroom. The master suite is also located on the third floor and has a king bed with breathtaking views of the gulf through its large bay windows along with a private balcony. The master bathroom suite has a soaking tub, large stone shower, and a double vanity. The views from the wrap around balconies are something to remember! Sunsets are picture perfect from this beautiful home. Across from the main house, you will find the carriage house and the enclosed private pool. Each side of the carriage house has its own kitchen with granite top counters, and stainless steel appliances. Relax in the open living space with plenty of seating. As you continue to the two bedrooms, one features a King bed as the other has handmade wooden queen over queen bunk beds with trundle beds. The main house features 4 bedrooms and 5.5 baths. The carriage house A & B units are identical, mirror-images in their floor plan with 2 bedrooms and a shared bathroom each, for a total of 4 additional bedrooms and 2 additional baths. There is sleeper sofas in each living room at the carriage house for additional space. 3) 8 bikes are included in the rental. To utilize, waiver must be signed and received before code provided. Please contact Saxon Smith with Bikes4U at 850.399.1230 with any bike questions.